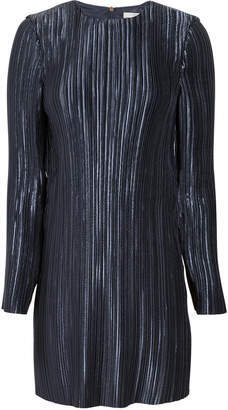 This sheath dress merges understated pleats with a structural collar and flounce hem to garner a sculptural aesthetic. Ruffled pleated collar Sleeveless Back keyhole self-tie closure Adjustable buckle belted waist Flounce hem Silk lining Polyester/silk Dry clean Imported SIZE& FIT Sheath silhouette About 47.5" from shoulder to hem Model shown is 5'10" (177cm) wearing US size Small Please note: This style runs large. We suggest ordering one size down. Contemporary Sp - Contemporary Collections. Tibi. Color: Black. Size: XXS.